I’m not going to dive into the super technical aspects of C#, since there are plenty of resources available for that (I included some at the end of this article). This is more of an overview of some experiences working in a new technology stack; A brief description of differences in core concepts, language features, and a comparison of development tools our team has used. 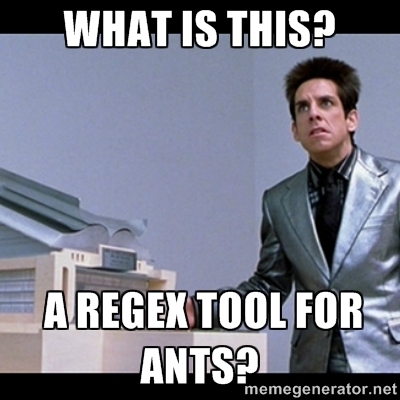 RegExr is exactly six years old today. Built in Flex and AS3, it was a largely accidental outcome of exploring a few technical concepts I was interested in at the time (tokenizers/lexers, advanced text interactions, regular expressions). I thought the end result might be useful to others struggling to learn or work with RegEx, so I released it online. Its popularity took me by surprise, with around 10M hits and 150K patterns saved to date. This is despite being essentially abandoned since 2008. I’m happy to announce that the neglect is finally ending, with today’s release of RegExr v2. Rebuilt from scratch in HTML/JS, and (hopefully) improved in every way. I’d like to believe that RegExr v2 is the best way to learn, build and test RegEx online today. Now that it’s released, we’re going to try not to let it stagnate again. The first order of business is to clean up the code and commit it to the RegExr GitHub repo, so that it becomes a living project with community support. We’re also going to try to clean up the existing community patterns – likely scrubbing any that now have errors (due to differences in AS3 and JS for example). Following that, I’m going to be taking a look at different options for wrapping it in a desktop installer, so you can run it offline and save your favourites locally (input on this is welcome). I’d also love to make it usable on mobile devices, not because I think there’s a huge demand for testing regular expressions on mobile phones, but as a challenge to see if it can be done well – I think the “click to insert” feature of the reference library could work really well. I’m also planning to write up a blog post exploring some of the technical challenges and decisions that we made while building this. If you enjoy using RegExr, you can help out by tweeting, facebooking, gPlussing, blogging, or otherwise sharing/linking to it so others can find it. Version 1 disappeared almost completely from Google a few months ago (I believe they downgraded pages with only Flash content), and I’d really like it to recover in the rankings. As always, I’d love to hear what you think of the new version of RegExr, and any feedback on how to make it even better. I’ve seen a few people complaining about and/or questioning the lack of mature tools to develop content for the modern web (aka HTML5), and it got me thinking about the evolution of these tools, and how challenges are solved for technology platforms in general. In my (albeit limited) experience, there is a natural progression for a maturing technology stack, particularly one without a single master (ex. Flash and iOS development differ somewhat because the tools and platform are directed/developed by the same entity). First, you will see the development of a lot of frameworks, starting with micro-libraries that address a single challenge, and evolving to macro-frameworks like JQuery that tackle an entire workflow. Developing frameworks has a very low barrier to entry, and provides an ideal way for developers to explore and share a variety of potential solutions for challenges. Because the libraries are written in the domain language, it also means that any developer encountering a problem can address it directly with a language they are familiar with. As problems become better defined, and specific solutions begin to emerge as more dominant, you start to see single purpose tools created, often as command-line utilities. These have an increased investment compared to frameworks, and require that the developer has knowledge of both the problem domain, and basic desktop development. Next, you will see partial workflow tools, which aggregate and leverage the single purpose tools (either directly, or by borrowing approaches). These put a UI on top of a number of solutions to make them more accessible to users. Again, these involve increased investment, and require additional capability (UX/UI design, more advanced desktop development). Finally, you will see the emergence of full-scale workflow tools. These represent a major investment, generally require a team of specialists to create, and are built over the course of months or years. As such, they need to build on top of standards, approaches, and frameworks that have been well vetted by real-world use. Even then, their early releases will be limited, and will require a huge amount of community feedback and multiple revisions to “get it right”. With this in mind, early release with rapid iteration is a critical practice for any tool that aims to be successful in this space. As an aside, code editors tend to follow an accelerated path, simply because the problems they are solving are less tied to a specific technology platform, and have been thoroughly explored for other languages. Of course, none of these steps happen in isolation. In the JS world, you can see all of these underway simultaneously. There is an unending stream of new frameworks, as developers explore challenges, with a number of more mature ones gaining traction. There are a number of popular single-purpose tools (ex. LESS, Closure Compiler, Zoë). There are a few partial workflow tools (ex. CodeKit). And finally, there are a number of early entries in the more robust tool category (Edge, Sencha Animator, Flash Pro’s Wallaby, etc). Further, this evolution is massively complicated and slowed in the HTML/JS world by the constant flux of the technology, the non-trivial issue of supporting multiple browsers/platforms, and the question of legacy support. Tool makers need to wait for a standard (or more frequently, a collection of standards) to stabilize and be broadly adopted/accepted before they can risk the investment to build on top of it. This is obviously a simplified look at the problem, but hopefully helps illustrate where things are today, and why we don’t have access to fully mature tools for HTML5 development yet. They are coming, but it’s going to be an incremental process.